A Financial market is a market for creation and exchange of financial assets. Financial markets act as a forum to facilitate financial transactions through the creation, sale and transfer of financial securities. 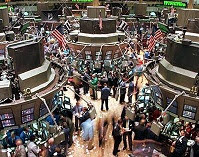 If you buy or sell financial assets, you will participate in financial markets in some way or the other. Financial markets play a key role in the economy by stimulating growth influencing economic performance of the actors, affecting economic welfare. This is achieved by financial infrastructure, in which entities with funds allocate those funds to those who have potentially more productive ways to invest those funds. A financial system makes it possible a more efficient transfer of funds. Financial markets play a pivotal role in allocating resources in an economy by performing three important functions. The continual interaction among numerous buyers and sellers who throng financial markets helps in establishing the prices of financial assets. Well organized financial markets seem to be remarkably efficient in price discovery. That is why economists say: “If you want to know what the value of a financial asset is, simply look at its price in the financial market”. Investors can readily sell their financial assets through the mechanism of financial markets. In the absence of financial markets which provide such liquidity, the motivation of investors to hold financial assets will be considerably diminished. Thanks to negotiability and transferability of securities through the financial markets, it is possible for companies and other entities to raise long term funds from investors with short term and medium term horizons. While one investor is substituted by another when a security is transacted, the company is assured of long term availability of funds. The two major costs associated with transacting are search costs and information costs. Search costs comprise explicit costs such as the expenses incurred on advertising when one wants to buy or sell an asset and implicit costs such as the effort and time one has to put in to locate a customer. Information costs refer to costs incurred in evaluating the investment merits of financial assets. There are different ways of classifying financial markets. One way is to classify financial markets by the type of financial claim. The Debt market is the financial market for fixed claims of debt instruments and the Equity market is the financial market for residual claims or equity instruments. A second way is to classify financial markets by the maturity if claims. The market for short-term financial claims is referred to as Money Market and the market for long-term financial claims is called as Capital market. Traditionally, the cutoff between short-term and long-term financial claims has been one year – though the dividing line is arbitrary, it is widely accepted. Since short-term financial claims are invariably debt claims, the money market is the market for short-term debt instruments. The capital market is the market for long-term instruments and equity instruments. A third way to classify financial markets is based on whether the claims represent new issues or outstanding issues. The market where issuers sell new claims is referred to as the Primary market and the market where investors trade outstanding securities is called the Secondary market. A fourth way to classify financial markets is by the timing of delivery. A Cash or Spot market is one where the delivery occurs immediately and a Forward or Futures market is one where the delivery occurs at a pre-determined time in future. A fifth way to classify financial markets is by the nature of its organizational structure. An Exchange-traded market is characterized by a centralized organization with standard procedures. An Over-the counter market is a decentralized market with customized procedures. Return on Investment or ROI is amount of profit or returns investors expect from their investments. All investors want to make a positive return or profit on the money they commit to their investments. In a nutshell, this is the basis behind the term “Return on Investment”, also known as ROI. 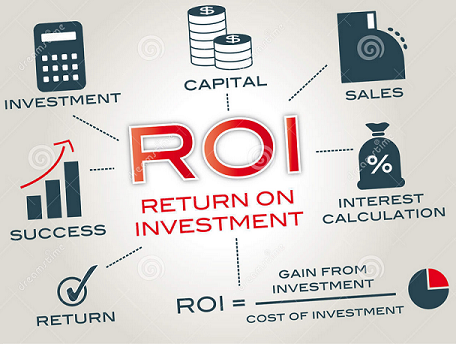 ROI is mathematically defined as (gains-cost)/cost, and is usually expressed as a percentage. Before we delve into some of the nuances of ROI, lets look at a simple example. You have $1000 you wish to invest on a promising stock. You research your idea and decide to buy $1000 worth of shares. Time goes by and your idea is working out: the stock rises in price and you sell your shares, receiving $1500 from the sale. Your initial investment was $1000, and your profit (before taxes and commissions) was $500. In the example cited, your return on investment, therefore, was 1500 + 1000/1000, for a return of 0.5, or 50%, on your investment. ROI is used not only for stocks but for all kinds of investments and business endeavors. It is applied to investments in real estate, oil wells, collectibles, bonds, precious metals and any other form of investment. As is often the case in the financial arena, there can be a number of factors to consider when calculating ROI, making some calculation more complicated than the simple example cited above. In the area of stocks and bonds, one would want to factor in dividends and interest received when calculating ROI. In the world of real estate, ROI calculations can become quite complex. The real estate investor must factor in rental income, appreciation, amortization, insurance and property upkeep. Even collectibles, such as rare coins, paintings, and the like may have substantial maintenance costs, which need to be factored into ROI. In some industries, Return of Capital Invested, or ROCI, is used instead of ROI. In the oil and gas industry for example, exploration and development expenditures are extremely high, and payoffs on investments may not be realized for many years. Hence ROCI is often used in businesses such as these instead of ROI. Another metric related to ROI is Compound Annual Growth Rate, or CAGR. This is a calculation made to approximate the annual return on an investment that pays out over a number of years and at a variable rate. It is not a Return on Investment, but rather an attempt to show how an investment would grow over time if it grows at a steady rate. A final nuance to consider is the role of leverage in investments. Many people buy stock on margin (a form of leverage) and most business finance their investments by borrowing (potentially another form of leverage). The effect of leverage should be incorporated in ROI calculations. In summary, ROI is a very useful concept to keep in mind. It enables the investor to calculate how well an investment has performed. Consideration of likely outcomes for any investment can be viewed through the lens of the ROI calculation to help in the assessment of potential investments going forward. A 401(k) plan is a tax qualified retirement savings plan that is contributed to by your employer. Employees can save and invest a portion of their paycheck into the 401(k) account before taxes are taken out. This serves two beneficial purposes: to potentially bump them down a tax bracket and to provide their savings compounding interest for many years with delayed taxation. The earnings from investing in a 401(k) are also tax deferred. A benefit of the 401(k) is that the investor is allowed control of how their money is invested. Most 401(k) plans offer a selection of mutual funds comprised of securities such as bonds, stocks and other assets. However, the most common option are Target-Date Funds. Target-Date Funds address some date in the future, usually retirement in order maximize investment returns. It is structured to gradually become more and more conservative as the investor reaches retirement. The 401(k) plan is full of restrictions. For the most part, investors must work for their employer for a certain amount of time before they can gain access to their employer’s contributions. Usually employers match 3% of their employees’ salary for their 401(k) contributions. The best plan is to at least invest enough to get the full amount that the company matches. Other restrictions include early withdrawal penalties (usually 10%) which penalize for withdrawing money before retirement. Generally speaking, there are only these three emergency withdrawal options. Hardship withdrawals are allowed for certain qualified hardships. Unfortunately there is usually still a withdrawal penalty and taxes owed on these withdrawals. Loans against the 401(k) are usually allowed as long as the loan is repaid with interest. 72(t) withdrawals are withdrawals that are usually allowed based on an individual’s life expectancy. These withdrawals eliminate the 10% early withdrawal penalty and require that withdrawals must be taken for at least 5 years or until the age 59 and a half has been reached. Taxes still must be paid on the amount withdrawn, however. There are two 401(k) options offered, the traditional and the Roth. The main difference being that the Roth 401(k) is comprised of contributions that have already been taxed and thus no taxes are paid upon withdrawal. The Roth also usually has more flexibility in accessing money invested. Overall, contribution to a 401(k) is a great investment option for anyone who is concerned about having enough money once retired. Always remember to try to make the maximum contribution to the 401(k) each year and to at least contribute enough to get the full amount that the company matches.